PanARMENIAN.Net - Ukranian President Petro Poroshenko stated on Twitter on Thursday, December 6 that the country is reinforcing its military on the Russian border. 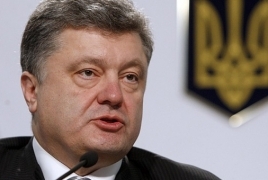 "…military units from the Ukrainian armed forces have been redeployed to the most dangerous directions along the entire line of our border [with Russia] in order to strengthen defensive capabilities", Poroshenko said. The news comes amid escalating tensions between Moscow and Kiev over the Ukrainian ships that were detained by Russian Border Guards after breaching the country's maritime border near the Kerch Strait. The Russian Foreign Ministry has described the Ukrainian vessels’ actions as a provocation committed in violation of international law. According to Russian President Vladimir Putin, Kiev's actions were aimed at establishing martial law ahead of presidential elections in Ukraine.